Whether you are doing a lot of weight bearing exercise such as running or non-weight bearing such as swimming, it is vital you look after your bone health by meeting your calcium needs. Milk and low fat cheese are an important source of calcium, which is needed to build and maintain healthy strong bones and the calcium in dairy products is easily absorbed. Other sources of calcium include nuts and green vegetables such as leeks. Preheat the oven to 180°C /Gas Mark 4. Place the milk, olive oil spread, flour and bay leaf in a saucepan, season, and whisk together over a medium heat continually until it comes to simmering point and has thickened. Turn the heat down to its lowest possible setting and allow the sauce to cook gently for 5 minutes. Then, stir in most (50g) of the Parmesan, remove the pan from the heat and discard the bay leaf. Heat the olive oil in a large frying pan, add the leeks and red peppers and cook until softened (approximately 5 minutes). Transfer into a large bowl and stir in the ricotta and cashew nuts. Season with black pepper and a pinch of salt. 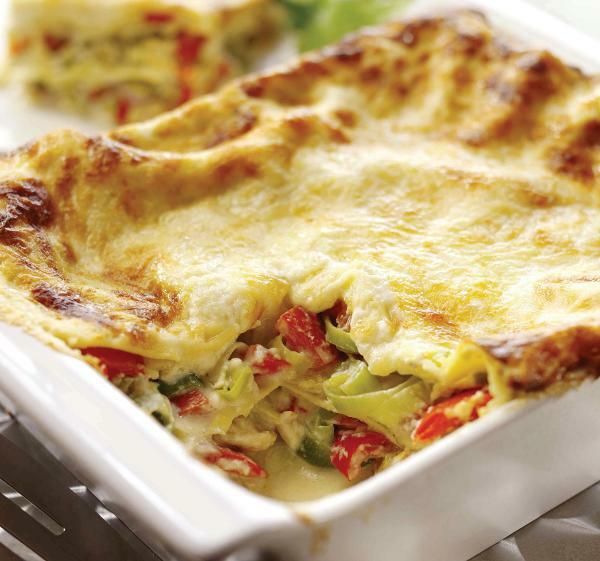 Assemble the lasagne by spreading one-quarter of the sauce into the bottom of the dish, then one-third of the leek mixture and place sheets of lasagne on top of this. Repeat the whole process, this time adding one-third of the grated Mozzarella, then the lasagne sheets. Repeat again, finishing with a layer of pasta, the rest of the sauce and the remaining Parmesan and Mozzarella. Bake for 50-60 minutes until the top is golden and bubbling.